OUTI DE FALBAIRE - THE REAL ESTATE PILOT! DEAR OUTI, THANKS FOR THIS INTERVIEW, WHERE DO YOU ORIGINATE FROM? I was born and raised in Finland and completed my education there. I left for Africa as a young agronomist on a two year contract to work at the Commercial Farmers Bureau in Lusaka, Zambia. I ended up staying in Zambia for four years and ran a stockfeeds import company and a small farm. During my years in Zam-bia I learnt to fly purely out of necessity as distances were very long. I was totally bitten by bush flying and ended up doing a Commercial Pilots licence in Zimbabwe. This is where I met my husband who is French Mauritian and was working in Zimbabwe as a pilot. THIS IS SO EXCITING AND ADVENTUROUS! WHAT ABOUT YOUR FAMILY? farm in Finland for many generations. My father was a veterinary surgeon, my mum a housewife and I have one elder sister. IN ALL THIS ADVENTURE, WHAT WAS A TURNING POINT OF YOUR LIFE? I left Finland in 1992. It was not my in-tention to leave permanently, I thought I would return after two years and continue my life in Finland! I love Finland and was meant to do a two year adventure abroad, that's all. 22 years later now, and of course I never returned except for annual holidays. I moved from Zambia to Zimbabwe in 1996 and got married there in 1997. All our three kids were born in Harare, Jean in 1998, Anais in 1999 and Julien in 2001. HOW DID YOU LAND IN MAURITIUS? We left Zimbabwe in 2005 and settled to live in Pointe d'Esny. The first year was difficult for me, I missed Africa and my life there, I also missed Finland and I could not speak French very well. 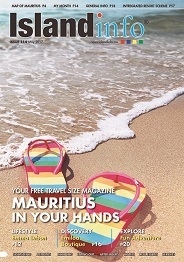 I quickly learnt French, started my business, the kids settled in well and very soon Mauritius felt like home. 2009 it has then been full go! I ex-panded into long term rentals and property sales and still kept my holi-day rentals portfolio going on as well. we opened a second office in Grand Bay. Emmanuel and I complete each other very well, he is an IT engineer and very calm and I am more of a commercial type. We specialise in short term rentals and property management as well as IRS and RES sales and local sales of property. We have just opened our third office and now have offices in Grand Bay, Blue Bay and Black River, so all three main coasts are covered. At the same time we have done a rebranding and our new name is ILOA. Our clientele is from all over the world, but my focus is also to provide a service to Scandinavian nationals in their own language. Finnish is my mother tongue and I am fluent in Swedish as well. I love the sea, I love the fact that I can swim in the mornings, I love the social life, I love the challenge of business and meeting all the people you do meet in this profession.